Last run of the day at Badger Pass. Chas, behind his board, is making and hoarding a battery of snowballs in preparation for Ford’s arrival off the bunny slope under the Bruin lift. Chas refused to eat all day due to excitement. So, he was punchy as hell. 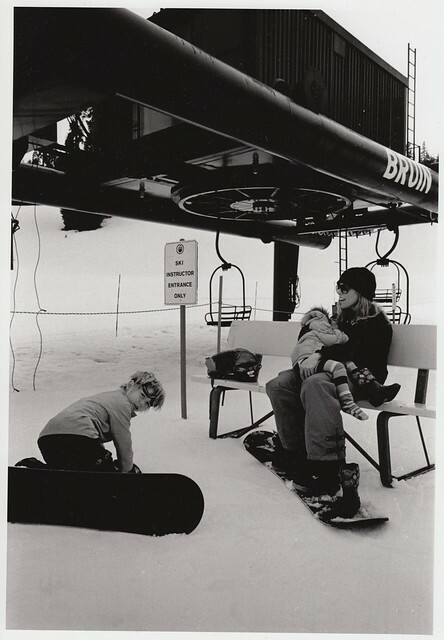 On this day, both boys learned to snowboard in under two hours–now they take the lift on their own and make it down the hill without falling. Not bad. Jolene hit her wall and dropped her boot to get some end-of-day nummy. There was nobody around to bother us, so Steph plopped down on the bench under the running lift. We had several minutes to ourselves before Ford arrived to receive Chas’ surprise attack–a success. The history of winter sports in Yosemite National Park is unique. Following the building of the Ahwahnee Hotel in 1925–1927, came Yosemite’s first ski school in 1928 with Jules Fritsch as instructor. Fritsch, a Swiss ski expert was part of a trained staff of winter sports experts available in Yosemite. Fritsch and the staff led six day snow excursions in Yosemite from the Ahwahnee to Tenaya Lake to bolster the ski school. Many believe this ski school was the first in California. In conjunction with the Curry Company, one of the first projects was the 1927 construction of a four-track toboggan slide near Camp Curry. Dr. Donald Tresidder, the first president the Yosemite Park & Curry Company and its guiding force, saw the visitor interest in winter sports and immediately formed the Yosemite Winter Club. With the club’s enthusiast support, a small ski hill and ski jump near Tenaya Creek Bridge was built in 1928.